A lightened up and low carb version of shrimp and grits that is just as flavorful and comforting as the original. The grits are super creamy and cheesy! This post is sponsored by Smart & Final. 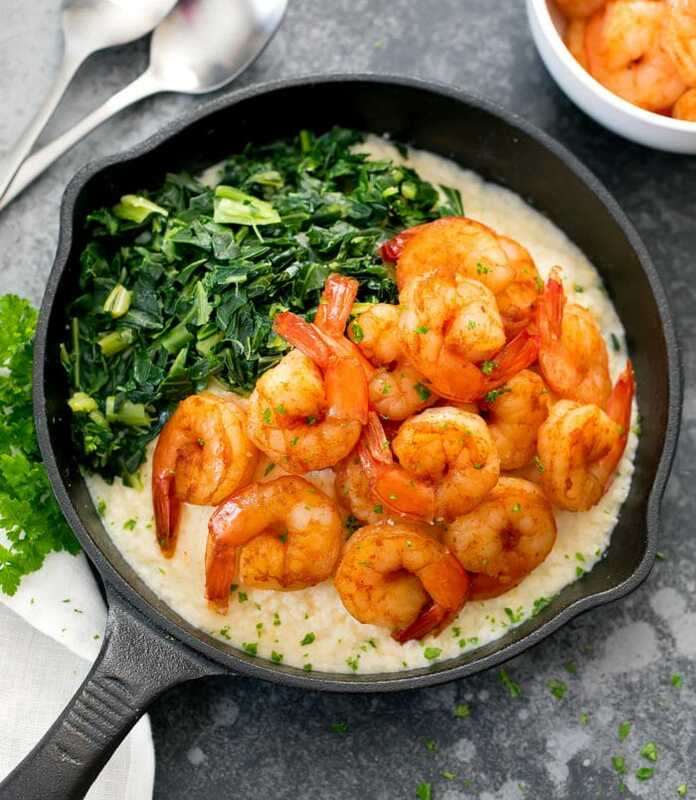 This month is Frozen Food Month and I’ve partnered with Smart & Final grocery warehouse store to share my version of shrimp and cauliflower grits using several frozen food products. I keep quite a lot of frozen food items in my freezer. Some items I always have in my freezer include seafood like shrimp or fish (the shelf-life is so short on fresh seafood) and frozen vegetables like corn, peas, and cauliflower rice (I make cauliflower fried rice several times a week). To help celebrate Frozen Food Month, Smart & Final is running special promotions on their frozen food items as well as a contest to win a trip to Hawaii. 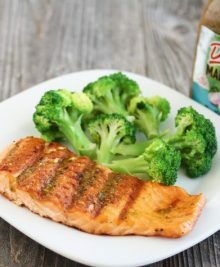 I’ve generally found Smart & Final’s prices to be cheaper than most supermarkets and the current Frozen Food Month promotions just made everything an even better deal. They also offer club sized products and don’t require any club membership. 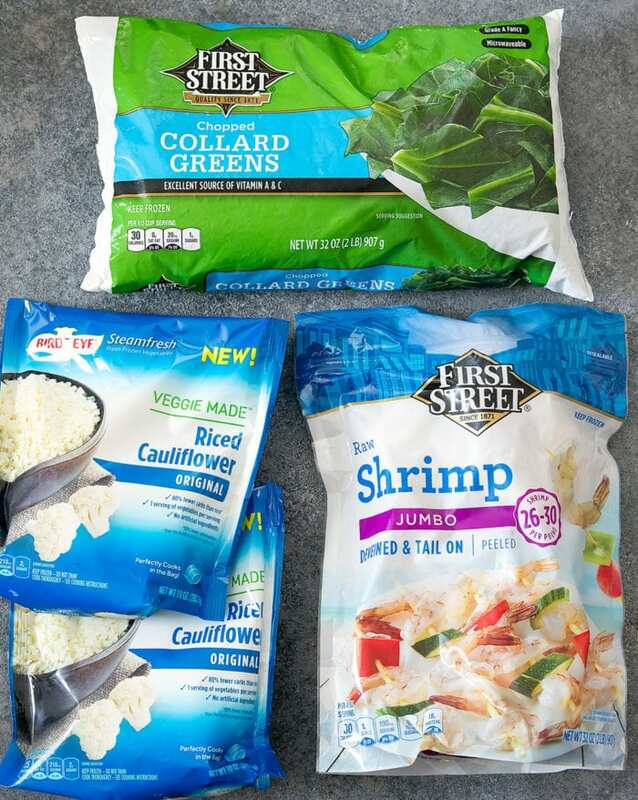 During my shopping trip, I picked up First Street Shrimp 26/30 tail on, First Street Collard Greens, and Bird’s Eye Steamfresh Riced Cauliflower. First Street is Smart & Final’s private brand and I really love the quality. Smart & Final also offers grocery delivery on their mobile app or online. 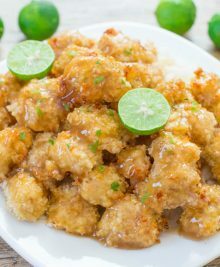 I placed an order a few days ago for more shrimp and some other grocery items because my husband requested that I make this again. I plan on experimenting with a blackened shrimp version next time just to mix it up. These cheesy cauliflower grits are prepared similarly to traditional grits. They are just as creamy and flavorful. My husband didn’t even realize it was cauliflower until I told him. First, you want to pulse the cauliflower rice down to very small pieces, about the size of grits. 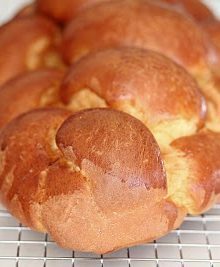 You can also do this with cauliflower florets. The cauliflower is then simmered on the stove with butter, milk, and a little salt. Once everything is nice and creamy, you add in the cheese and stir until melted. I recommend using freshly shredded cheddar. Freshly shredded cheese will have a creamier consistency than pre-shredded cheese. The shrimp are smoky and spicy thanks to a blend of smoked paprika, garlic powder and cayenne pepper. The shrimp are seared for about 2 minutes on each side and then they are ready to eat! 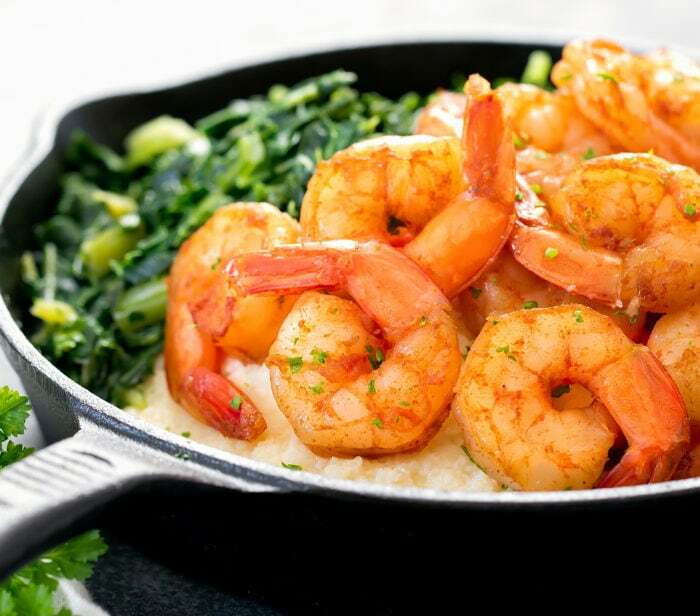 A low carb version of shrimp and cauliflower grits that is just as flavorful and comforting as the original. These cauliflower grits are super creamy and cheesy. 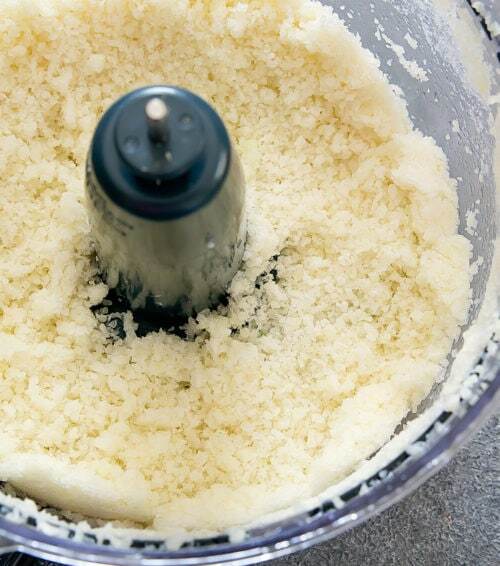 Pulse cauliflower rice in food processor until they are the size of grits. Pat dry and then add to a medium saucepan. Add in milk and butter. Bring mixture to a simmer, stirring often so that the cauliflower does not stick to the bottom of the saucepan. It may seem that you do not have enough liquid at first but the cauliflower will release liquid when it heats up. 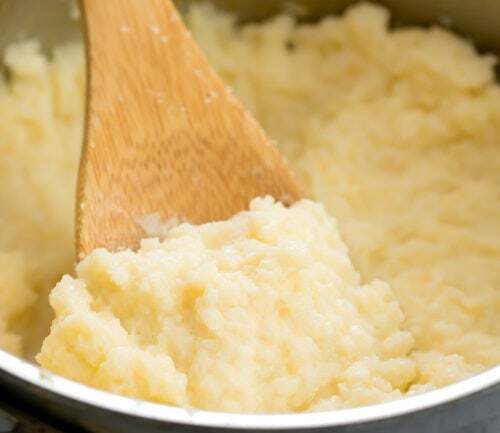 Cook for about 10-15 minutes or until mixture is thickened and cauliflower grits are creamy. Season with salt. Stir in cheese and cook until cheese is melted. Set aside and keep warm. In a small bowl, add paprika, cayenne, garlic powder, salt. Whisk together. Place shrimp into a medium bowl. Sprinkle seasoning mix over shrimp. Toss shrimp in seasoning until evenly coated. Let shrimp marinate for about 5-10 minutes. Add olive oil to a large skillet. Bring to medium-high heat. When oil is hot, add in the shrimp. 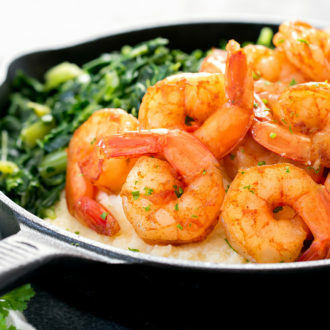 Place shrimp into skillet, spacing them out as a single layer over the surface of the skillet. 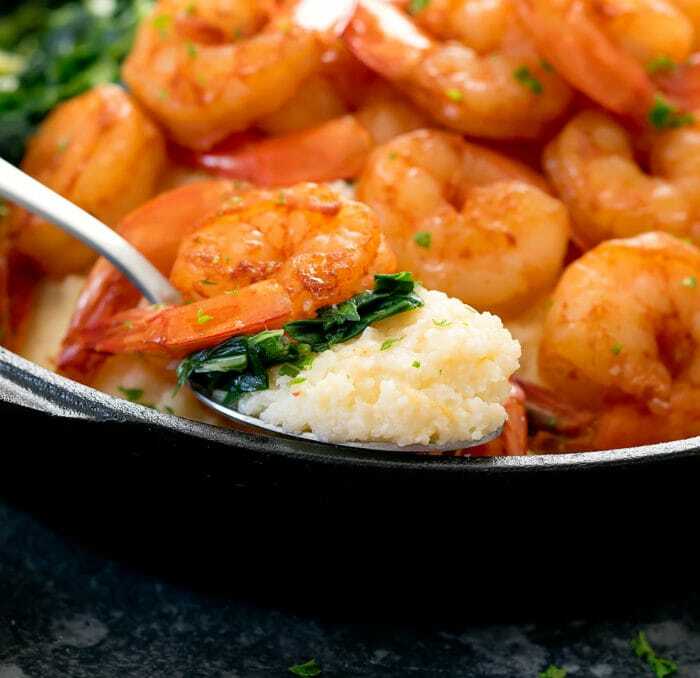 Cook for about 2 minutes on each side or until shrimp are fully cooked. Garnish with parsley. Remove from stove and keep warm until ready to serve. Using the same large skillet, add oil and bring to medium-high heat. Add in collard greens. Saute until greens are wilted. Season with salt and lemon juice. Frozen shrimp sodium levels can vary. I recommend only adding a pinch of salt to the seasoning mix. Once the shrimp are cooked, you can taste and add more salt, pepper, as needed. The shrimp have a definite kick to them. To make less spicy, reduce the cayenne pepper. Cauliflower will release water once it is heated so don’t worry if it doesn’t seem like there is enough milk at first. Let the cauliflower cook a few minutes and you will see more liquid appear. Smoked paprika is not the same as regular paprika. I recommend smoked paprika for this recipe otherwise your shrimp won't have any smoky flavor and the paprika flavor may be too much.